Above average for a fairly typical hardboiled crime thriller, Christopher McQuarrie's Jack Reacher benefits from the writer-turned-director's keen sense of timing. If only his sense of humour was as well developed. When the film plays for laughs, there's a weary, almost cynical acknowledgement of the dusty archetypes being trotted out. This is when Tom Cruise's take on British scribe Lee Child's tough-as-nails wandering vigilante (a class with long cinematic lineage, with membership ranging from The Littlest Hobo's London to Mad Max's Max Rockatansky and beyond) is at his most endearing. Cruise plays the observant ex-military police officer with a mix of tired resignation and lethal confidence. Like Elmore Leonard's Marshal Raylan Givens, this is a man who doesn't want to resort to violence, but if pressed, will handle matters with deadly, brutal efficiency. 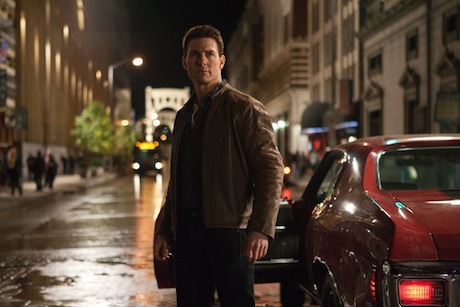 Story-wise, Reacher is a solid enough whodunit? concerned with looking beyond convenient details to see the bigger picture. An ex-military sniper is booked on very compelling evidence for the murder of five seemingly random victims. Rather than confess when pressed by a cocky D.A. with a flawless conviction record (Richard Jenkins), the accused asks for Jack Reacher, a nearly mythical man who operates entirely off the grid. Even though he doubt's the man's innocence, Reacher agrees to investigate the case at the behest of a defence attorney, who happens to be the D.A. 's daughter (Rosamund Pike, looking a wee bit uncomfortable in a role stuffed full of underdeveloped daddy issues). Unsurprisingly, there are more sinister machinations at work, leading to a series of well-choreographed and often quite amusing physical altercations, a gritty, believable, refreshingly clearly shot car chase and an inevitable, unexpectedly low-key, but no less potent climactic confrontation with shadowy criminal mastermind the Zec (Werner Herzog, whose over-the-top seriousness is quite funny, intentional or not). McQuarrie's celebrated (The Usual Suspects) but inconsistent (The Tourist) scripting abilities and capable action direction (The Way of the Gun) keeps this familiar scenario clipping along at a consistently entertaining pace, but the level of self-aware cheekiness involved in the story's many inflamed clichés isn't made very clear.